International Social Health Care Policy, Program, and Studies presents a collection of papers drawn from the Ninth Doris Siegel Memorial Fund Colloquium that focuses on social work and international health issues, emphasizing an international exchange and cooperation as a crucial facet of meeting global health challenges. Honoring the memory and spirit of social work pioneer Doris Siegel for her accomplishments and advocacy on behalf of social-health issues, this fine selection of scholarly papers explores ideas and strategies from around the world which offer greater opportunity for success for diverse social work and health care problems. Internationally recognized practitioners and academics offer research and case studies illustrating approaches, programs, and policies that any practitioner or policymaker may find helpful. International Social Health Care Policy, Program, and Studies closely examines the common ground in social health care problems shared by various countries worldwide. Issues such as the effects of terrorism, academic-practice partnerships in practice research, and the international exchange program are explored, with insightful discussions that explain in which directions to best channel social and health care energies and resources. Helpful figures and tables further explain concepts and research. 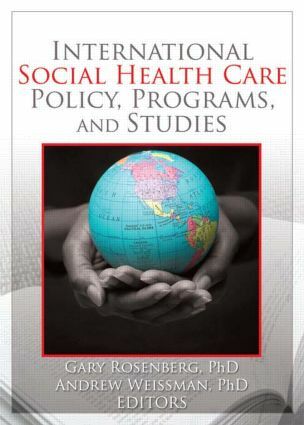 International Social Health Care Policy, Program, and Studies is horizon-expanding reading that is perfect for social workers dealing with a global community, social work libraries, educators, students, and libraries of all types.